21 v. : 24 cm. wholesale grades, established by the Department, are given. Making and preserving apple cider. (F 2125.) Supersedes F 1264. 16 p., illus. James F. Robinson, C. F. Woodward, and C. H. Hills. Agricultural Research Service. Price 10. Soil treatment an aid in termite control. (L 324, revised.) 7 p., illus. sedes G 26. Folder, illus. Agricultural Marketing Service. Price 50. Shopper's guide to U. S. grades for food. (G 58.) Supersedes M 553. Compiled by Eleanor W. Clay, Office of Information. PUBLICATIONS FOR SALE ONLY, SEE HOW TO ORDER ABOVE. Sur.l1. to AM 2.) 305 p. Agricultural Research Service. Price $1.75. illus. Agricultural Marketing Service. Price 15. Handling bales of cotton in public warehouses-Methods and equipment. (MRR 250.) 74 p., illus. Jo Brice Wilmeth and Charles D. Bolt. Agricultural Marketing Service. Price 45.
keting Service. Price 35. FOR SALE ONLY. illus. Russell H. Hinds, Jr. Agricultural Marketing Service. Price 150.
marketing of farm feeds. (MRR 268.) 10 p., illus. V. John Brensike. Agricultural Marketing Service. Price 10. B. Levine. Agricultural Marketing Service. Price 450.
weevil attack-exploratory tests. (MRR 272.) 20 p., illus. D. W.
charges. (MRR. 273.) 23 p., illus. Carl J. Vosloh, Jr., William R.
Overseas ventilated-shipping tests with Florida oranges and grapefruit. cultural Marketing Service. Price 150.
cars: A study of damage and cost reduction. (MRR 275.) 76 p., illus. Ronald A. Shadburne. Agricultural Marketing Service. Price 45.
liam E. Lewis. Agricultural Marketing Service. Price 100. Two-pen bull barn and lots, plan No. 5851. (M 769.) 1 sheet, illus. Agricultural Research Service. Price 50. Service in cooperation with International Cooperation Administration. Price 704. FOR SALE ONLY. illus. Agricultural Research Service. Price 54. PUBLICATIONS FOR SALE ONLY, SEE HOW TO ORDER PAGE 1.
sheet, illus. Agricultural Research Service. Price 50. Six corrals for beef cattle, plan No. 5835. (M 776.) 1 sheet, illus. Agricultural Research Service. Price 5. Evaluation of agricultural hydrology by monolith lysimeters, 1944-55. Microbiology and chemistry of grass silage. (T 1187.) 73 p., illus..
C. W. Langston and others. Agricultural Research Service. Price 300.
and Robert V. Bega. Forest Service. Price 5. SB 99.) 120 p. Agricultural Marketing Service. Price 55g. Historical forestry statistics of the United States. (SB 228.) 36 p.
Service. Price 10. FOR SALE ONLY. and Federal Extension Service. Price 10. 1958. Price 200 a copy, 750 a year, domestic; $1.00 a year, foreign. Agricultural Marketing. (Monthly.) Vol. 3, No. 10, October 1958. Agricultural Situation. (Monthly.) Vol. 42, No. 10, October 1958. 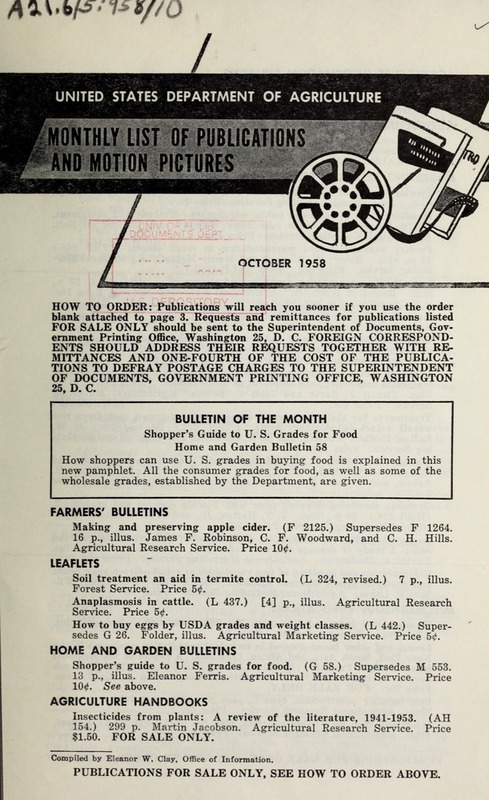 Bibliography of Agriculture. (Monthly.) Vol. 22, No. 10, October 1958. Extension Service Review. (Monthly.) Vol. 29, No. 10, October 1968. Foreign Agriculture. (Monthly.) Vol. XXII, No. 10, October 1958. $1.50 a year, domestic; $2.00 a year, foreign. FOR SALE ONLY. and white; running time, 4 minutes. Released 1958. Rural route or street no.